Scottish and Welsh government ministers have met in Cardiff to discuss opposition to UK Brexit legislation. The two devolved administrations have said they cannot recommend consent be given to the EU Withdrawal Bill. 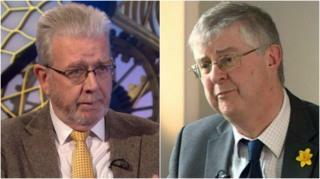 Scottish Brexit minister Mike Russell and Welsh Finance Secretary Mark Drakeford said their governments would resist any attempt to take away powers. UK junior Brexit minister Robin Walker called for a "grown up conversation" between the governments over the plans. Mr Walker, who is in Scotland for a two-day visit, said the legislation would ultimately increase the power of the devolved legislatures. Joining Mr Russell and Mr Drakeford at the meetings were the two administrations' top lawyers, Scotland's Lord Advocate James Wolffe and Welsh Counsel General Mick Antoniw. The two governments have coordinated recent opposition to the UK government, issuing joint statements on matters including the Withdrawal Bill and entering a formal dispute resolution process over regional funding in light of the £1bn Conservative-DUP deal. The repeal bill converts current EU laws onto the UK statute book, but has been decried as a "naked power-grab" by the Scottish and Welsh first ministers, Nicola Sturgeon and Carwyn Jones. They fear that powers over areas such as agriculture and fishing, currently devolved but exercised at a European level, will ultimately return to Westminster rather than being passed on to Edinburgh and Cardiff. The UK government says the devolved legislatures will actually gain powers as a result of the UK leaving the EU. Mr Russell said the administrations "cannot and will not stand by and let powers in devolved areas be taken by the UK government", saying the legislation "must be changed to respect devolution". The SNP MSP said: "It's going against the interests of Wales and Scotland, against their people, against the progress we want to make with the economy. We have to stop that happening. "That's why the first ministers from the two countries gave what is an unprecedented joint statement when the EU Withdrawal Bill was published. "The work we're doing today is making sure we're working together to try to persuade the UK government that their approach is simply wrong, and will not work, and has to change." Labour AM Mr Drakeford added: "On a series of issues related to Brexit, there's a strong identity of interests between the Welsh government and the Scottish government, between what matters to people in Wales and what matters to people in Scotland. "By sharing information and working together, we can maximise our impact on the UK government's thinking." However Mr Walker said it was necessary to have some common frameworks in order to conduct future negotiations with the EU, and to preserve the market within the UK. He said: "When people take a long hard look at it, I think it will be in the interest of each of the devolved parliaments and administrations to actually work with us to make this process work. "There does need to be a recognition in this process there are going to be areas where we are going to need to agree on common frameworks and that that is important not only in terms of the domestic functioning of our economy, but in also in terms of our market access to the EU. "So, that being a key objective of the Scottish government as they have set out in Scotland's Place in Europe, we would hope that they could engage constructively on that front as well. "There are no powers which currently sit that will be taken away from them but we've also been very clear that our overall strategy is to increase the power of each of the devolved administrations through this process." Reality Check: Can Scotland and Wales block the repeal bill?